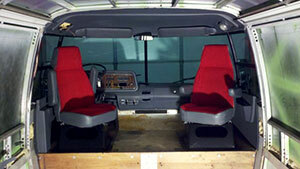 Many remember when a actual representative of the company would take the time to call on a new and existing customer. An actual partnership was created and confidence ensued. We at Interacter feel there is no better way to insure that the advantages and benefits of our product are presented thoroughly than to bring our organization to your door. 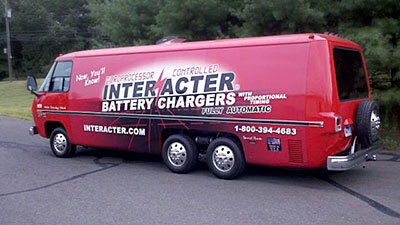 So we reinvented the idea of “On The Road Show” with this last one of a kind, custom designed “Mobile Technology Vehicle” On board this unique machine you will find a comfortable meeting area which will serve as a Product Display Showroom to introduce and educate your staff or customers to Interacter Battery Chargers. The Interacter MTV is available for your next meeting and presentation, customer demonstration, sales classroom or Trade Show.